In the monograph Monede şi bancnote româneşti (Buzdugan, Luchian and Oprescu, 1977) these coins are presumed to be made from nickel. It seems to be in fact nickel plated steel. The rust on the edge of the heavy worn coins is a good argument in support of the steel core, because the nickel is very resistant to corrosion. 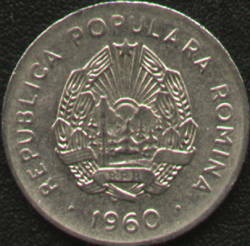 In the book Monetele României (Coins of Romania, by Iliescu and Radovici, 2004) is mentioned that this coin was struck in 1960, 1962 and 1964 - 1966, all coins bearing the same year 1960. Knowing that the Socialist Republic of Romania was proclaimed on August 21st 1965 by the Great National Assembly, who adopted a new constitution, striking coins with the People's Republic coat of arms in 1966 looks a bit weird. There is one explanation: the Socialist Republic coins with year 1966 were released into circulation starting from 1967. The tractor represented on the coin is a UTOS tractor manufactured at Braşov. Most likely it is a 45 horsepower UTOS-26, the first Romanian tractor with tires meant for ploughing, model manufactured between 1957 and 1962 at Uzina de Tractoare Oraşul Stalin (hence the name of the tractor), meaning Tractor Plant "Stalin City" . The city of Braşov was called Oraşul Stalin between 1950 and 1960. UTOS tractors were manufactured under MTZ license - Minsk Tractor Plant, USSR, today in Belarus. 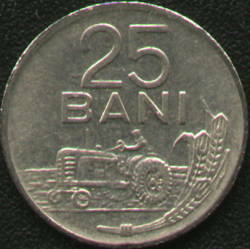 The same tractor appears on the 25 bani coins from 1966 and 1982, although in the meantime the Braşov Tractor Plant had introduced into production more performant tractors, as U-650.